Congestion pricing to solve peak-hour traffic jams? Not so fast! Evidence from Bangalore shows that congestion pricing is not as effective in reducing travel times as one might presume. Peak-hour pricing only marginally improved travel times, whilst also triggering schedule costs for commuters induced to change their travel times. Traffic congestion is a chronic problem in large cities across the world. Millions of urban commuters experience slow but aggressive traffic, noise and pollution fumes, on a daily basis. In Bangalore, commuters in the study described below spent on average 1.5 hours driving each weekday, at an average trip speed of only 14 kph. Economists have long proposed charging road users fees that scale with the amount of congestion. The idea is backed by common sense and by economic theory. Drivers impose “externalities,” namely a cost on society, notably by slowing down traffic. Typically, drivers do not take this into account, which leads to excessive congestion. Hence, judiciously chosen pricing can remedy this situation. 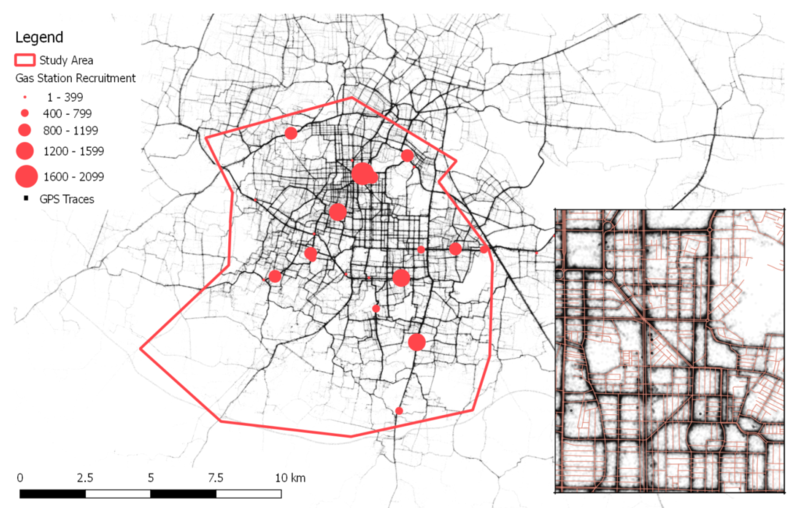 In a recent study, I report results from an experimental pilot of peak-hour congestion pricing policies in Bangalore, India, one of the most congested cities in the world. The findings show that peak-hour pricing would only marginally improve travel times, and the benefits would be lower when counting schedule costs for commuters induced to change travel times. A key reason is that, despite high levels of congestion, in Bangalore the marginal contribution of one more vehicle on increased travel times is roughly similar at any level of congestion. The study recruited real car and motorcycle commuters, who were approached by surveyors in randomly selected petrol pumps in South Bangalore. More than a quarter of eligible drivers agreed to participate, and they installed a smartphone app that collected data on commuting patterns, including departure times and routes. The data cover over 100,000 individual weekday trips and almost one million kilometres of travel inside Bangalore. 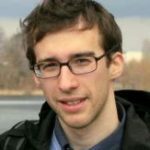 Commuters in the study were enrolled in an experimental pilot with congestion pricing policies, designed to measure their change in behaviour given pricing. Overall, 497 drivers were included. The focus of these policies was on improving peak-hour traffic congestion by inducing commuters to change when they travel during the day. Hence, the study does not quantify benefits from reduced exposure to pollution, nor responses to pricing in terms of switching to public transport. Two broadly realistic policies were designed and implemented. Under the “departure time” policy, trips were charged according to a pay-per-km rate that is zero for off-peak departures, and higher for departures close to the peak-hour. Under the “area” policy, commuters faced a flat fee for driving through a small area along their usual route, chosen to allow a longer untolled alternate. In practice, charges were calculated automatically and subtracted from a prepaid virtual account. Participants received the outstanding account balance at regular intervals. Thus, they faced real monetary incentives to change how they travel. (1) Commuters value time spent driving highly. (2) Commuters have moderate schedule flexibility. For example, a typical commuter is roughly indifferent to leave one hour earlier than usual in the morning, if that results in 15 minutes faster travel time. In summary, the experimental results showed commuters to be moderately flexible to change when they travel. However, to understand the consequences of congestion pricing we also need to know how road speeds are determined. Optimal congestion pricing depends crucially on the cost that drivers impose on society. This cost is quantified using the large data set of GPS traces (Figure 3). 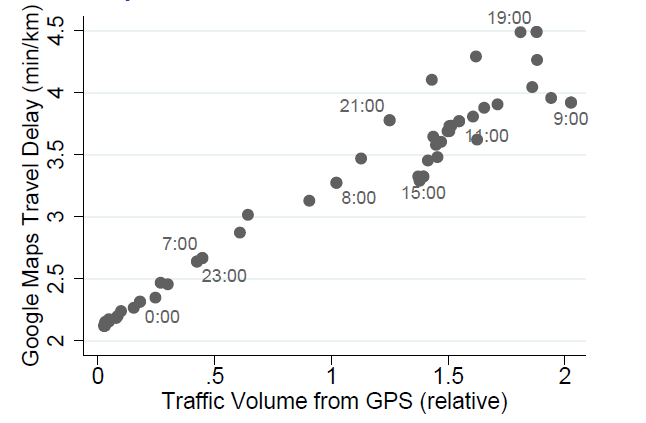 Making a half-hour trip during the peak-hour increases the aggregate driving time of everyone else by around 17 minutes, an effect that decreases linearly away from the peak-hour. This social cost is notable, yet smaller than previous engineering research in the US. Interestingly, Akbar and Duranton (2017) document a similar relationship in Bogotá, Colombia. This suggests that the road technology in these cities is fundamentally different from highways in rich countries. This may be due to low speeds in Bangalore even when roads are free, differences in driving style, the high fraction motorcycles, etc. The last step uses a model to simulate how a city-wide congestion pricing policy would play out, based on commuter responses and the externality. To make progress, several simplifying assumptions are required: in response to pricing, commuters in the model do not change home and work locations, nor the likelihood to use public transport or cancel trips. Peak-hour congestion pricing chosen optimally only delivers small benefits of 2-6% faster traffic. The gains are almost negligible when schedule costs are taken into account, namely 0.5% of the total trip cost, a gain of only INR 5 (8 US cents) per commuter per day. Intuitively, the social value of the travel time saved by removing commuters from the peak-hour is not significantly larger than the costs to those commuters of traveling at different, inconvenient times. The mere existence of severe traffic congestion does not, by itself, imply that the gains from congestion pricing would be substantial. Indeed, peak-hour pricing in Bangalore would only have a small benefit in terms of traffic speeds. It is of course possible that congestion pricing would still yield large welfare benefits, in other cities or along other margins. This study focused on trip timings, a margin of commuter adjustment that is plausibly malleable in the short run. However, in future research it is important to measure how drivers switch to public transport and carpooling in response to pricing, and how home and work decisions depend on travel and monetary costs. In addition, pollution exposure due to traffic slow-downs and motor vehicle accidents also encompass externalities. However, this study shows that such arguments require careful measurement and understanding of driver responses and the determinants of road traffic congestion. I later use the same data to implement pricing policies. In a real-world policy, charges may be based on data from GPS responders installed in vehicles: Martin and Thornton (2017) study such an experiment in Melbourne, Australia.